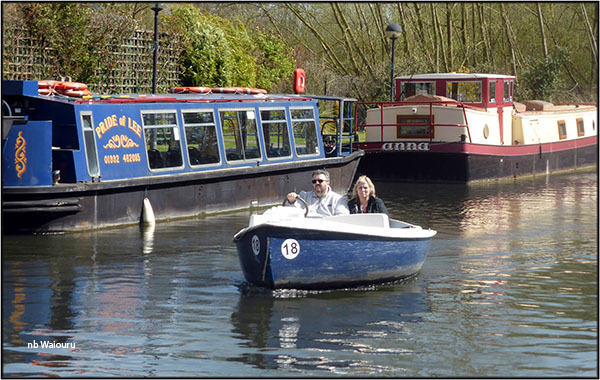 The plan was to cruise up one lock and moor outside The Crown at Broxbourne for the usual Sunday roast lunch. That went well and we found a mooring outside the pub. The problem was we wanted to top up the water tank and the water point was at the next lock. Consequentially the plan was amended. 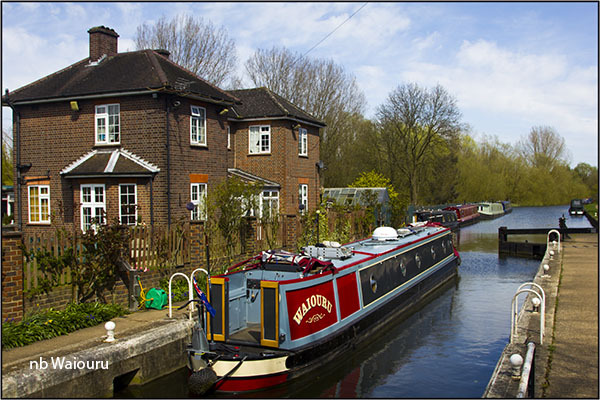 We would stop for lunch at The Crown and then cruise on to the next lock. Lunch proved to be a disappointment. We ordered the Sunday roast platter for two and the serving was very small. Probably the smallest we have seen to date. The meat was tender but the vegetables minimal (two slivers of carrots and two of parsnip). We left having eaten everything still feeling hungry. 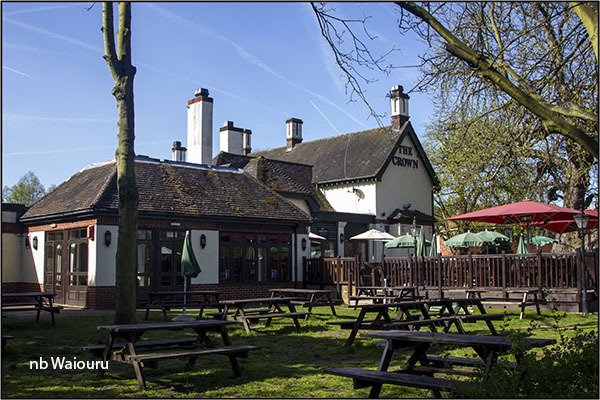 To date nothing has exceeded the roast lunch at the Anglers Retreat, Marsworth. 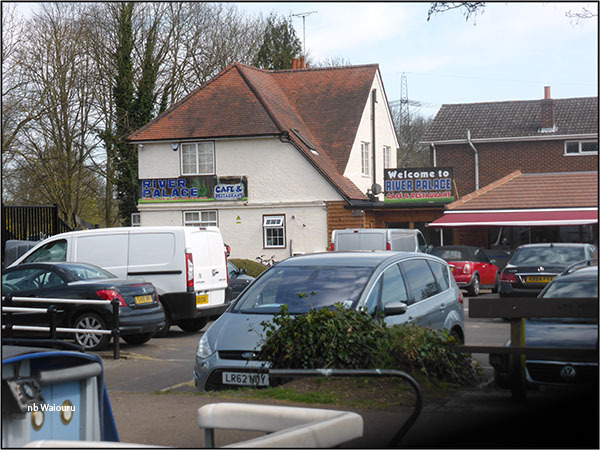 Lee Valley Boat Centre is located opposite The Crown and was doing great trade hiring out day boats and small launches. We couldn’t help being amused by the antics of the steerer on one short broad beam day boat. He was all over the river bashing into both banks and going in circles. Too much forward and reverse throttle. The families in the smaller launches appeared to be having a calmer time. The water tap at Carthagena Lock is outside the former lock keeper’s cottage which means you have to be in the lock to fill the tank. Fortunately no other boats appeared wanting to use the lock as it’s a slow filler! There were no vacant moorings above the lock so we pushed on to Dobbs Weir Lock where we met the erratic day hire boat coming back down the lock. It was obviously the first lock they had ever descended because they looked much like the Keystone Cops. Eventually they managed to get the boat out of the lock by bashing down the sides only to find Waiouru waiting on the lock landing. The steerer then didn’t know how to collect his crew. Eventually we got Waiouru into the lock which left him free to put dents into the lock landing with the bow and stern. Jan told a lady gongoozler at the lock about our lunch at The Crown and was informed we should have opted for the cafe at the next lock. She was told they serve a huge roast lunch for just over £6. Our luck! We tried to moor against the bank above the lock but it was too shallow. We pressed on eventually reaching Fieldes Weir lock at Hoddesdon. There was a solo handed boat on the lower lock landing when we arrived and a day boat attempting to come down. The solo hander was moored with tied lines on the bollards but made no effort to go and assist the two female novices on the day boat through the lock. Jan went up and assisted them down whereupon the solo boater started to untie his mooring lines. No doubt he expected Jan to work both him and Waiouru through the lock. I beckoned Jan back to the boat and suggested we moor where we were. We were two boat lengths back from the lock mooring and it’s not a bad spot. It took some time for the solo boater to realise he was going to have to work the lock on his own.